The US space shuttle Atlantis has lifted off on its final mission, carrying six astronauts to the International Space Station. Atlantis was first launched in 1985 and this mission, which launched at 2.20pm local time (7.20pm Irish time) from the Kennedy Space Center in Florida, is expected to be the ship's final flight. 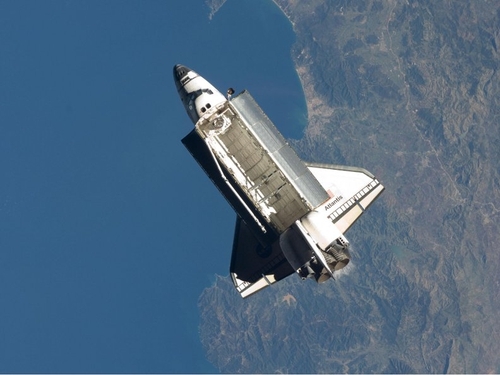 The 132nd space shuttle mission is the third of five flights scheduled for this year, after which the US plans to retire its three-ship shuttle fleet due to cost and safety concerns. Discovery is targeted for launch in September with spare parts and equipment. Endeavour is due to launch in November carrying a $2bn, multinational particle detector known as the Alpha Magnetic Spectrometer. Upon its return to Earth, Atlantis will not be retired. Instead, it will be prepared for flight in case the last shuttle crew needs a rescue ship. 'The possibility exists to turn that into an actual launch, the hardware is here. We're currently not doing that, but somebody could tell us to,' Mr Moses said. In February, President Barack Obama effectively abandoned plans laid down by his predecessor, George W Bush, to send astronauts back to the moon by 2020 and perhaps on to Mars with a new generation of rocket and spacecraft. Constrained by soaring deficits, President Obama submitted a budget to Congress that encouraged NASA to focus instead on developing commercial transport alternatives to ferry astronauts to the ISS after the shuttle program ends. The president wants to boost NASA's budget by $1bn a year and use the money to keep the space station flying beyond 2016, when it had been scheduled for retirement. Mr Obama's proposal is pending before Congress and is controversial, adding more uncertainty about the future of US human space programs. Last week, 800 shuttle-related manufacturing and support service jobs were eliminated, trimming the work force to 10,700, said program manager John Shannon. In Florida, officials estimate 8,000 NASA-related jobs will be lost when the shuttles are retired later this year. Nonetheless, Barack Obama set a bold new course in April for the future of US space travel, laying out a vision to send American astronauts into Mars orbit within the next three decades. He envisaged the design of a new spacecraft by 2025 for human travel deep into space and said he believed missions to asteroids and to orbit Mars by the mid-2030s were achievable.